Korean in Will.i.am’s video makes sense. You listening, K-pop? “Check It Out,” the latest video from Will.i.am (a member of the Black Eyed Peas), features Korean written in hangeul, the Korean alphabet. According to some reports, the Korean actually makes sense. Perhaps he got inspiration, or even proofreading, from when he worked with Korean girl group 2NE1. Here they are meeting Will.i.am for the first time. Here they are working on a song in his studio. Looks like he sees their “foreignness” as an advantage, and that he definitely had help with the hangeul. See the complete lyrics here. This is a bit of an old article, and I’m not sure if it’s been posted before by another blogger (I don’t think so), but it sure is worth the read, largely because of the interviews with two experts on Korea, Michael “Trod Underfoot by Samsung” Breen and Tom Coyner. Tom Coyner, president of Soft Landing Korea, said the strange use of English may possibly be due to it being categorized into three target consumption groups; domestic, international and foreign tourist. Coyner claimed the primary consideration in the category is how the English words resonate with the local population who may have a fundamental but inadequate grasp of the language, as seen from Super Pyeongtaek and Hi-Touch Gongju. “There can be linguistic or pedagogic connections between certain English words and corresponding Korean words, cultural points, etc. that are totally lost on most native English speakers,” he noted. Coyner said such examples are not only found in product advertising, building names, but also with local government promotions of towns and provinces. He believes the most controversial of the three is for international consumption. The management consultant said often prestigious and expensive international specialists are employed, but the specialists are overruled by the bureaucratic desire to “localize” the international expertise. “This may be done out of a desire by local bureaucrats to privately boast that they came up with the final slogan,” he said. 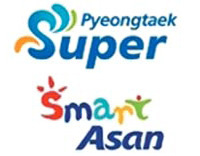 Coyner claimed, if not out and out weird, the choice of English words associated with a place’s slogan often seem rather arbitrary, such as Colorful Daegu, Ulsan for You, Happy Suwon, and Nice Jecheon. As for foreign tourist consumption, he said while these examples were attempts to be helpful, they were made without asking foreigners to review signage or even checking a dictionary before ordering the signs to be made. Is anyone (in a position of influence) listening? Frankly, I wouldn’t hold my breath. The desire to brag to one’s friends in the same bureaucracy, “That’s my slogan!” probably outweighs any concern about making one’s country look like a bunch of yokels. It’s a song by G-dragon. It’s not one of his big hit singles, but it’s gained notoriety for being accompanied by, at his concert, a video in which he stalks and murders some girl. Actually, the song itself is pretty decent. Unlike most Korean rappers, he doesn’t do the staccato monotone that I dislike so much. And if you read the translated lyrics, you can see that he’s trying to have a kind of Eminem’s Stan-style twist at the end. I just threw up my bagels and shmeer. Those schmucks have some chutzpah to sing schlock like that. Oy vey. We have updates on a pop star’s recent epic FAIL at English. And guess what? At the very end of Part Four, we learn that they’re going to go to register at an English hogwon (private education institute). The hilarity may have only begun. First, some background information: Jo Kwon, of the boy band 2AM, and Ga-in, of the girl group the Brown Eyed Girls, are playing the role of a couple on the reality show “We Got Married.” Such couples are given various challenges that they have to overcome. Today’s challenge was the fearful and difficult task of … meeting a foreigner. When they first see the foreigner, an Afghanistani student, through their electronic peephole, they’re thrown into a panic. They slowly begin to get more comfortable, mostly because Kwon uses his iPhone to look up conversation questions. When Kwon goes out to buy some snacks for their guest, Ga-in tries her hand at iConversation, resulting in her telling him, “I want to kiss you and take a dump on your chest.” That’s some epic FAIL right there. You have to wonder who wrote or proofread those dictionary entries? The fun starts around 4:00 of Part 1 and continues into Part 2. First and foremost, I must point out that the writer of this story is Kang Shin-who, whom Brian has accurately described as Korea’s worst journalist, because he has put words in people’s mouths, among other things. Officials at the city and provincial education offices, which are in charge of hiring native English speakers, formed a consensus that they might not give Indian English teachers the same wages given to other native speaking teachers. “It would be tough for Indian teachers to compete with other native English speaking teachers, unless they take lower salaries,” he added. Officials are taking the “I really don’t want to, but circumstances are forcing me” line, but I’m sure that they’ll be happy to pocket the difference. The Korea Herald has an article about a recent study, published in Science magazine on Dec 10, that indicates that all Asians migrated from Southeast Asia upwards. It contradicts theories that there had been multiple migration flows from both northern and southern routes. The analyses proposed a model in which ancestors of today’s Asian populations arrived first in India before migrating to Thailand, Malaysia, Indonesia, and the Philippines. From there, it suggested groups traveled north, mixing with the populations already living in these regions. This accordingly suggested the ancestors of Koreans, Chinese and Japanese to be the latest to settle in East Asia. The study also revealed no meaningful genetic differences between the three ethnic groups, which together make up 1.5 billion people. The study’s conclusions are supported by linguistic studies. Scientists also disclosed the corresponding relationship between genetic ancestry and language groups. “Our results show that genetic ancestry is strongly correlated with linguistic affiliations as well as geography. Most populations show relatedness within ethnic/linguistic groups, despite prevalent gene flow among populations,” they wrote. The study found that, as expected, individuals who were from the same region, or who shared a common language also had a great deal in common genetically. This study has been described as “[T]he first comprehensive study of genetic diversity and history of Asian populations”. Dr. [Edison] Liu [executive director of the Genome Institute of Singapore and president of the Human Genome Organization (HUGO)] said that it was “good news” that populations throughout Asia are genetically similar. This knowledge will aid future genetic studies in the continent and help in the design of medicines to treat diseases that Asian populations might be at a higher risk of. And the discovery of this common genetic heritage, he added, was a “reassuring social message”, that “robbed racism of much biological support”. The Korean government plans to have English classes in public schools to be taught entirely in English by the year 2012. In preparation, some Korean English teachers are taking English classes at “hogwons” (education institutes).